Motorola MC9190-G - Condensation Resistant, Wi-Fi (802.11a/b/g), 2D Imager, Windows CE 6.0, 256MB RAM/1GB ROM, 53-Key keypad, Bluetooth. Interface cables and charging cradle sold separately. Single slot charging cradle kit (Part# CRD9000-110SES). Quad slot charging cradle kit (Part # CRD9101-411CES) requires AC line cord (Part# 23844-00-00R). 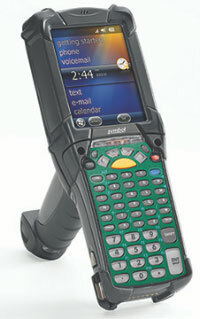 The Motorola MC9190-G mobile computer is more rugged, more powerful, has a higher resolution display, better scanning performance and more scanning options than its predecessors. The next evolution in the highly successful MC9000 Series gives your workers the ability to process information and take action quickly and accurately, even in the harshest of environments. The MC9190-G offers the very latest in scanning technology, so no matter what type of barcodes you need to scan or their condition, you can count on accurate first-time split-second scanning. Whether you are currently using 1D, 2D barcodes or direct part marking (DPM), the MC9190-G's revolutionary 2D imager engines deliver high performance and easy omnidirectional scanning. The Motorola MC9190-G takes rugged design to a new level. Just like its predecessor, the MC9190-G passes the same industry-leading toughness tests, operating reliably after exposure to heat, cold, dust, rain, a spilled cup of coffee, and 2,000 consecutive tumbles in our rotating tumble drum. 3 Year Zebra OneCare Service Center Essential. Does not include Comprehensive coverage. Does not include coverage for cradles. 1 Year Zebra OneCare Service Center Essential. Does not include Comprehensive coverage. Does not include coverage for cradles. The Motorola MC9190-G30SWEYC6WR is also known as MOT-MC9190G30SWEYC6W	or MC9190G30SWEYC6WR	.